Get suited and booted at English Cut’s inaugural stand-alone central London store, which offers both bespoke and made-to-measure tailoring. 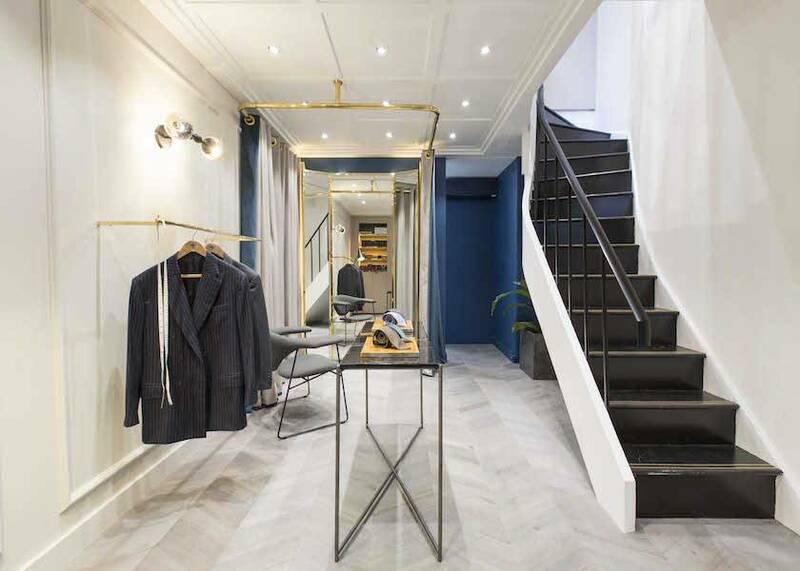 A new destination for British tailoring has landed in London’s W1, as English Cut opens the doors to its Chiltern Street flagship. Rubbing shoulders with other luxury menswear offerings like Trunk Clothiers and Club Monaco, as well as being a mere stone’s throw from Chiltern Firehouse, the well-positioned boutique offers everything the discerning man needs for his contemporary, considered wardrobe. Founded by Savile Row tailor Thomas Mahon – former Head Cutter at Anderson & Sheppard – in 2001, the brand has gone from strength to strength over the last 15 years, creating beautifully-cut suits for clients all over the world. As the name suggests, English Cut bespoke suits are crafted entirely by hand in the UK, with each stage of the production process taking place between workshops in London and Cumbria. Soft tailored suiting with a modern twist is a specialty, with designs adhering to a quintessentially English sensibility. With its modern minimalist décor, the new flagship is split across two floors. The ground floor level houses English Cut’s versatile off-the-peg range, which encompasses tailoring and formal accessories mixed with more casual pieces like jeans and knitwear. Downstairs, however, is where the real magic happens; a warm, intimate space where customers can be fitted for a bespoke suit or English Cut’s unique MTM (made-to-measure) Code, consisting of three levels with variations across style, cloth and finishing to suit the wearer’s personal preferences and budget.